Attorney General Jeff Sessions has submitted his letter of resignation to the White House. "Thank you for the opportunity, Mr. President," he closes. Where this leaves the investigation led by special counsel Robert Mueller is anyone's guess. This, as others have noted, is the moment of maximum danger for the probe. 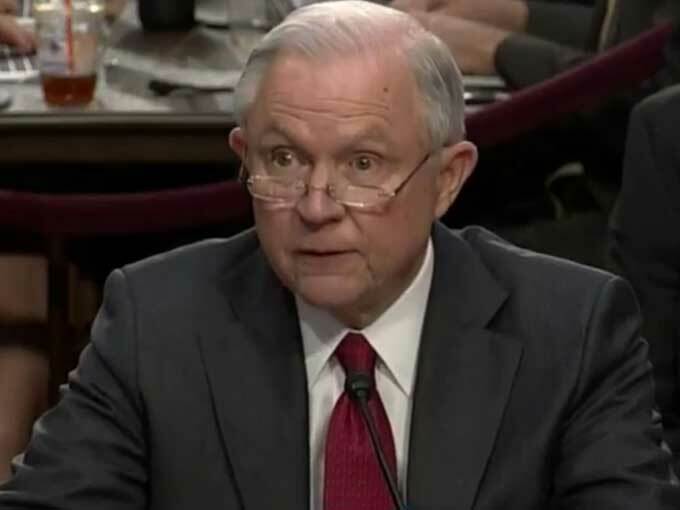 Sessions threatened so-called sanctuary cities with the loss of federal funding and announced a "zero tolerance policy" for people who cross the southern U.S. border illegally. He ordered federal prosecutors to seek the most serious charges and stiff prison sentences against drug criminals, a stark reversal of former President Barack Obama's most prominent and bipartisan justice policy. Will never forget that August 2015 rally in Mobile, Alabama where 30,000 people watched Jeff Sessions put on a Trump hat before other GOP lawmakers were willing to do so publicly. There would be no President Trump without Jeff Sessions' early support. Here's the moment Schumer spox @mattwhouse handed his boss a note during his press conference saying AG Sessions had just resigned. Can Kris Kobach become Attorney General without first finishing his six hours of court-ordered legal training?